SLCG Blog: Pension Purchase Agreements; The worst “investment” in the world? Pension Purchase Agreements; The worst “investment” in the world? In recent years, platforms for buying and selling pension benefit payments have been created and gained traction. Voyager Financial Group (VFG) operated one of the largest and most active exchanges for buying and selling pension payments. There is limited information available on the size of this market because these firms have operated under the radar of securities regulators. In pension benefit agreements, a pensioner agrees to turn over a specific number of their future pension benefit payments to an investor in exchange for an upfront lump-sum payment. Typically the seller and buyer do not meet, although some limited information about the seller is disclosed to the buyer. Keeping the seller and buyer segregated means the two parties do not know the compensation to, and therefore the incentives of, the intermediaries. This means the seller does not know the price paid by the buyer, and the buyer does not know the price received by the seller. Why do the two prices differ? Because a series of intermediaries gleans hefty commissions and fees for making the arrangement. Pension purchase agreements have drawn increased scrutiny in recent years as securities regulators catch onto these schemes. Several states, including California (available here), Arkansas (available here), and New Mexico (available here) have issued orders preventing the sale of pension benefits. New York State, at the direction of Governor Cuomo, has initiated an investigation into these activities (story available here). 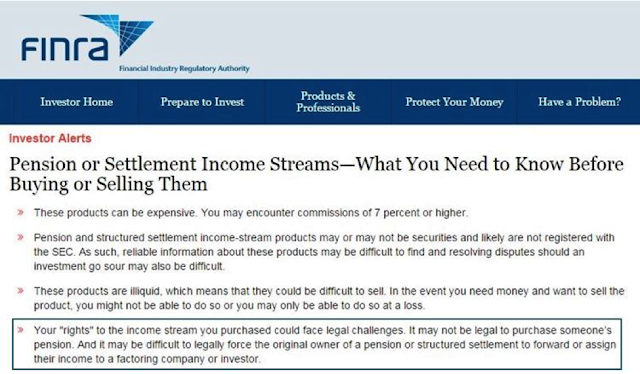 The U.S. Securities and Exchange Commission (available here) and FINRA (available here) have released bulletins and investor alerts highlighting the important factors to consider prior to participating in the sale or purchase of pension payments. Perversely, the increased attention and scrutiny on pension purchase agreements in the popular press has likely exacerbated the losses to investors. The press coverage has helped inform pensioners that the contracts are often unenforceable, which has given many the idea to cease forwarding their checks or divert their pension payments back to their own accounts. According to the Arkansas Consent Order, VFG pocketed nearly 20% of the investor’s capital ($6.7 million from $34.2 million proceeds). In addition to VFG’s take, they paid commissions to other distribution agents. It appears the investor’s financial advisor was typically paid a commission of approximately 7% of the price paid by the investor, which is itself large relative to the typical commissions on mutual funds or exchange-traded funds. The fees and commissions are typically not disclosed in pension purchase agreements. The pension benefits seller does not know the price paid by the buyer. The commissions, plus other profits to distribution agents, come from the difference between the investor’s purchase price and the amount paid to the pensioner. These high costs are undisclosed to the buyer and seller. Also undisclosed in these deals are the conflicts of interest and interests of affiliated parties. What motivates the buyers and sellers to enter into these agreements? The pensioner may be willing to exchange a number of their pension payments for the immediate lump-sum if they have an unexpected expenditure such as medical bills or to purchase other investments. Pension investors are attracted to the seemingly secure payments that they expect to receive regularly over time. For example, an investor may pay approximately $100,000 to purchase 10 years of $1,160 monthly payments, cumulating to approximately $139,000 in payments. Unfortunately for many investors, they receive only the first two years of payments after the pensioner took steps to divert the pension payments to another account. Often, the pensioner ceases to surrender their pension payments soon after receiving the investor’s lump-sum payment. Diversion of the payments may be accomplished by simply failing to forward the checks they receive or by redirecting the funds to another account. In many cases the agreements are legally unenforceable and they are left to suffer large losses. For example, by law U.S. military pension and disability payments are non-transferrable, rendering these agreements unenforceable. The majority of contracts that SLCG has analyzed entail an investor purchasing the U.S. military retirement pension payments of a former service member. Not surprisingly, all of those payments ceased within a year or two of the agreement, leaving investors without the stable income streams they expected. The critical flaw in pension purchase agreements is that the investor does not acquire the underlying asset, they only acquire a tenuous, unsecured claim on the cash flows. In fact, the pension payments are made to an escrow account opened in the pensioner’s name, over which they assign control rights to a trustee. The Achilles heel in the structure is that the pensioner has the ability to divert the payment away from the escrow account. As time passes, the seller’s willingness to continue forwarding the checks diminishes as the lump-sum payment amount upfront has likely been used for other purposes. It is not surprising that so many sellers simply stop forwarding their payments. On the surface, a secondary market for structured payments may appear to improve allocative efficiency by providing an opportunity for pensioners to capitalize their payments while providing other investors who seek yield opportunities an opportunity to purchase annuity payments. In reality, this is an opaque market where unregistered intermediaries have operated below regulators’ radar. The firms facilitating these transactions circumvent regulatory oversight by falsely claiming the pension contracts are not investments. Pension purchase agreements are simple fraud. They present unsophisticated investors with stable, dependable cash flows but investors invariably suffer large losses as the underlying circumstances which led the pensioner to sell their future pension payments cause them to stop forwarding the pension checks. Unfortunately, the critical flaws in the agreements’ design, and that are insurmountable given the illegality of transferring or assigning most pension payments, combined with the lack of regulatory oversight, have saddled investors with huge losses when they depend on income and capital preservation to provide for their living expenses.